Discover health benefits of oatmeal! It reduces bad cholesterol and maintains blood pressure, but it's not just for breakfast anymore! Oatmeal is a natural skin cleanser. It removes dirt or impurities, exfoliates, softens and soothes skin. It benefits many skin types: dry, itchy, oily, inflamed, sensitive or acne-prone. It leaves skin with a natural, healthy, glow. Do you suffer with oily skin? Oatmeal removes surface dirt and impurities. It gently exfoliates. Do you suffer with acne or blemishes? Oatmeal helps get rid of blackheads, acne and reduce inflammation. It gently deep cleans pores without irritation. You can have acne relief! Do you suffer with dry itchy skin? 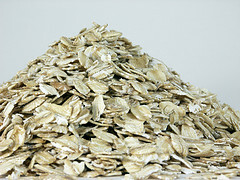 Oatmeal helps restore the natural moisture balance to skin. It's very soothing. An oatmeal bath can relieve eczema, chicken pox, rashes and insect bites. Do you suffer with dull skin? Oatmeal can help provide a natural glow. It deep cleans, gently exfoliates, softens and restores moisture. Do you suffer with sensitive skin? Exposure to products with harsh ingredients can cause skin irritations and sensitivities. Harsh ingredients strip the skin's acid mantle taking it far away from its natural pH level. Oatmeal is gentle. In some applications, it's even used on baby skin. DRY SKIN: Slice 1/2 cucumber, (peeled) into small pieces. Place in blender. Add 1/2 cup unflavored dry oatmeal, 3 tablespoons unflavored yogurt, 1 tablespoon organic honey. Blend ingredients together for a smooth pasty texture. Place in refrigerator to cool. Apply to face. Let stand for approx. 25 minutes. Rinse with cool water. Gently pat dry. ITCHY SKIN: Place 1 cup of, unflavored, dry oatmeal into blender. Blend to a fine powder. Slowly pour into tub of water. Stir tub, with hands, for even distribution. Soak in tub for 15 - 20 minutes. Gently pat dry. For babies only use 1/3 cup of oats. OILY SKIN: Blend 6 tablespoons unflavored dry oatmeal to a fine powder. Slowly add water for a smooth pasty texture. Apply mixture to face. Let dry. Rinse with cool water. Gently pat dry. NATURAL GLOW: Mix 1 tablespoon of unflavored dry oatmeal and 1 tablespoon of organic honey to a thick pasty texture. Gently apply to face, in circular motions, with hands. Let stand for approximately 25 minutes. Rinse with cool water in circular motions too. Gently pat dry. Aloe & Oats goat milk soap contains aloe vera juice, oatmeal, goat milk and other natural ingredients. Soothe dry itchy skin, remove impurities, exfoliate and relieve acne. Learn how to make soap with soap recipes.